Frog and fish populations have been declining at an alarming rate throughout the world – and when they die, they often die en masse. Although the reasons vary, one cause for mass deaths is the rapid spread of a virus. Now a Wilfrid Laurier University researcher is trying to do something about it. 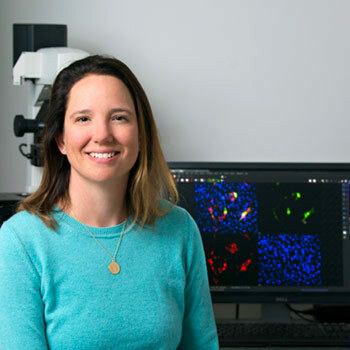 Assistant Professor Stephanie DeWitte-Orr is an expert in innate immunology, which means she studies the natural, non-specific defence mechanisms that all organisms and their cells employ against foreign invaders. A member of the departments of Health Sciences and Biology, she has worked with fish, mostly rainbow trout, for years and has more recently begun studying frogs. When it comes to fish, her long-term goal is to develop an antiviral drug or vaccine that can be added to fish feed. This would help fish farms, where fish can be highly susceptible to the mass spread of viruses, and also the natural environment, because viruses can spread beyond fish farms. Currently, vaccinating farmed fish involves stabbing individual fish with a needle – a labour-intensive and expensive process. Oral vaccines and antiviral drugs would be more efficient and cost-effective but are not extensively used due to scientists’ lack of understanding of gut-associated immunity, says DeWitte-Orr, who won a prestigious Early Researcher Award in 2016 for her work. DeWitte-Orr works mostly with cells, though she plans to start working with live fish at Laurier and at the University of Guelph’s animal care facilities next year. The heart of DeWitte-Orr’s work is trying to enhance innate immunity to better protect cells – and therefore the organism – against viruses. Almost all viruses produce long strands of double-stranded RNA while they are replicating. As healthy cells don’t make double-stranded RNA – theirs is single-stranded – they can recognize double-stranded RNA as dangerous. DeWitte-Orr and her team are now working on making artificial double-stranded RNA molecules of specific sequences and lengths and seeing how cells respond to them. The artificial RNA is designed to not actually be dangerous but when designed correctly could stimulate cells to protect themselves from an invading virus. It could become the basis for an antiviral drug or it could be added to a vaccine to increase its efficacy, says DeWitte-Orr. In frogs, DeWitte-Orr is researching a ranavirus (frog virus 3) that can cause 90 to 100 per cent of an infected population, usually tadpoles, to die. “It’s called the Ebola for frogs. It’s bad,” says DeWitte-Orr, adding the same virus can also infect fish, though usually with less catastrophic results. Understanding how the virus infects Ontario frogs is important because previous work has almost entirely been done on an African frog. Some frog populations appear to be highly susceptible to the virus while others are resistant, says DeWitte-Orr. Due to the lack of monitoring, it’s hard to say just how often viral mass deaths occur or if they’ve been increasing in frequency. However, climate change and environmental toxicants appear to be making frogs more susceptible to virus infection. DeWitte-Orr is trying to understand just how environmental toxicants such as pesticides make frogs more susceptible to ranavirus infection. She is also trying to develop a method for detecting ranavirus in wild Ontario frogs. DeWitte-Orr is additionally working on a related project with a partner at the University of Alberta, Edan Foley, Canada Research Chair in Innate Immunity, and with two industrial partners in Ontario and Alberta. DeWitte-Orr and Foley secured a $500,000 grant, announced May 7 by the Ontario Centres of Excellence (OCE), to do research on immune response in animals. This research involves using nanoparticles to deliver micronutrients, such as selenium, to support innate immunity and enhance health in animals including fish and cattle. That grant comes from a consortium comprising Ontario Centres of Excellence, Alberta Innovates-Technology Futures, the industrial partners in both provinces, and the Natural Sciences and Engineering Research Council of Canada.